The move is approaching. Not everything has been going as smoothly as desired but hopefully these things will be sorted by Monday or Tuesday. Fingers crossed that I'm in our new flat come the next weekend. It'd be nice to be living with my husband once more. I'm with him in Berlin right now, but he's been gone since the 3rd because he took up work on the 4th. Adding up the moving and travelling back and forth between Berlin and Bamberg, we've been parted longer and more frequently since the wedding than in the five years before. So odd. In the meantime, and despite a flat in boxes and disassembled furniture, I had a very pleasant visit by a good friend from the UK and my sister to keep my company. Karaoke, good food, and lots of laughter certainly, and thankfully, took my thoughts of my packed up sewing machine and fabric stash as well. 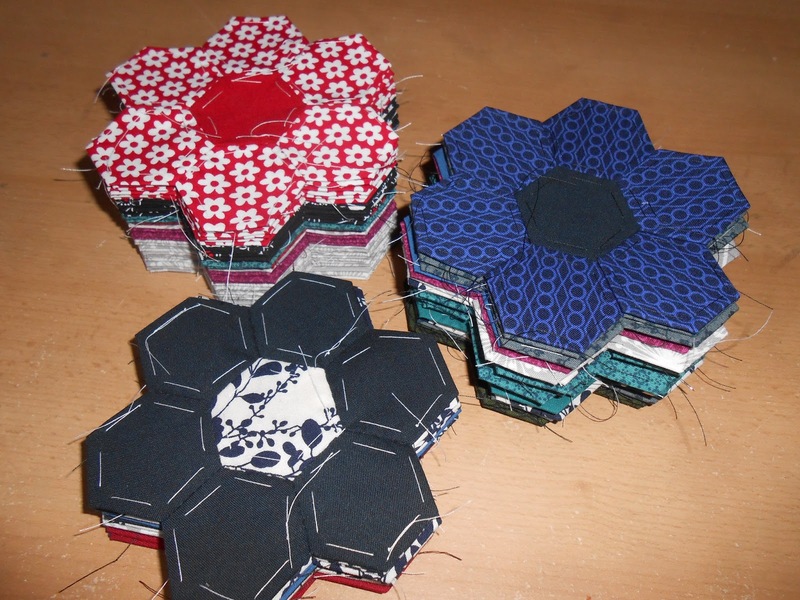 Never fear, though, there's things to keep my fingers busy still - hexies! Before our last move I basted a ton of them but never actually got around to sewing them up. They definitely came/comr in handy now. On the top left are the 29 finished flowers from before the move, on the bottom are 13 I've assembled and finished over a couple of days whilst packing, and on the top right are 24 with the petals finally attached to the centre that will keep me busy until we, well I, finally move and on the train. I suppose I'll have to give my hexies some serious thinking and layout-ing after the move to see where exactly they'll be going. Exciting! I'm off to catch up with your blogs now. Happy sewing! P.S. My blogiversary is only three weeks away. Oooh, what to do, what to do? Fingers crossed I'm back online fully by then. 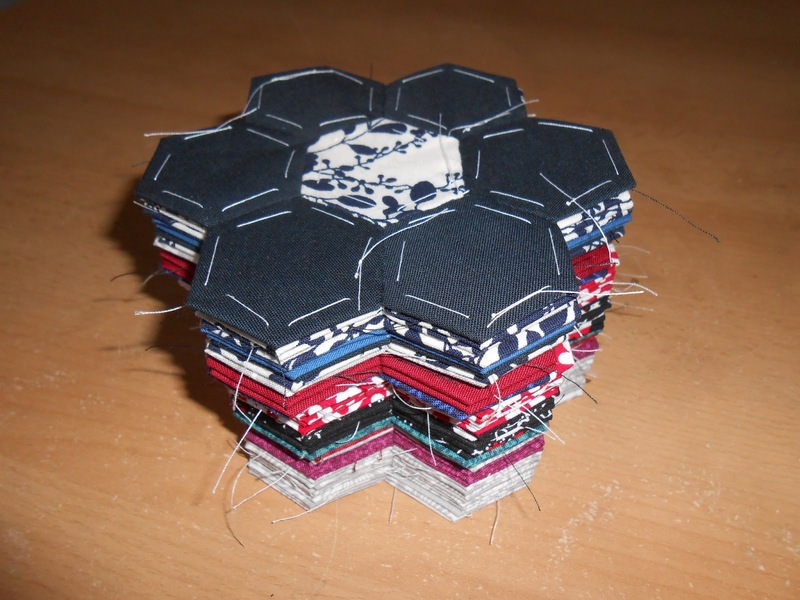 The hexies are looking good! I think that's a great idea to prepare a bunch to take along with you. Best of luck with the last details of your move! I have to empathise that you have moved twice in six months. Packing is never fun. 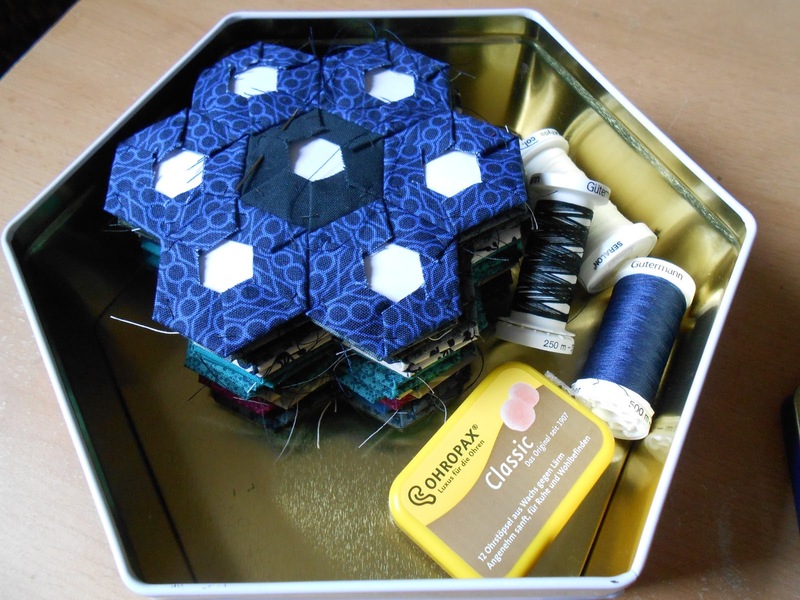 But that hexi tin is serving you very well through them all. I hope that your move goes well and without incident! 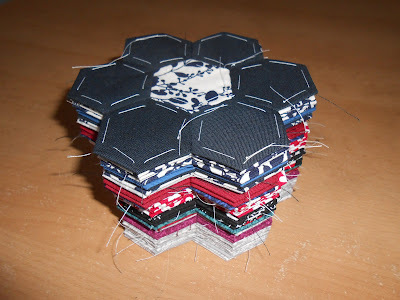 The hexies are beautiful. I've never attempted anything like that, so it's nice to look at other people's projects. Visiting from Show & Tell. Have a great day! That is a lot of hand stitching! Looks wonderful and good luck on the move- we visited Germany in the fall and are returning to Berlin for a few days before on to Scotland in the summer! You are so lucky to live there!